Ever find yourself not really sure why you are in a certain shop, or street? Not really sure what propels you to pick up certain books, flyers or leaflets whilst out on a wander? 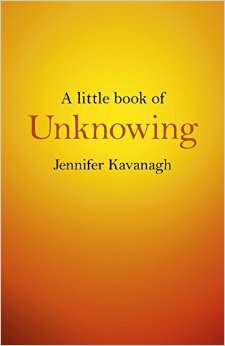 That’s how I first came to know of Jennifer Kavanagh, author of A Little Book of Unknowing… published yesterday! I stumbled upon a flyer for Journey Home Game whilst co-curating Anxiety Festival 2014. I was searching for creative ways to inspire conversations about wellness and mental health. Well actually, who knows what comes next? A Little Book of Unknowing is a gem of a book, that is slim enough to slip into your bag and ponder it’s wisdom, provocations and amazing array of quotes on the tube or train to work, as I have over the last 4 weeks. So much of our day to day lives are planned to within inches or to do lists about to do lists. We believe we ‘have no room for error’ or that we can’t be a ‘failure’. What would life be like if we just let ourselves go ‘off plan’? Through reading Jennifer’s book you’ll find yourself nodding in agreement and be left with as many questions in different ways than before you began and this is a good thing. As someone who for most of my life believed “I had to know it all or else I’d be stupid, a failure, a loser…” learning to know what I don’t know has been at times hugely painful, shameful and now finally liberating. And learning to embrace what it is I do know is a hugely profound, now joyous and relieving experience. This leads to more connected, synchronized and blessed interactions with ourselves, with others and Life. This treasure of a book sensitively invites us into a greater sense of knowing our own abilities to create and live a life lived in creativity, meditation, love, faith and connection.